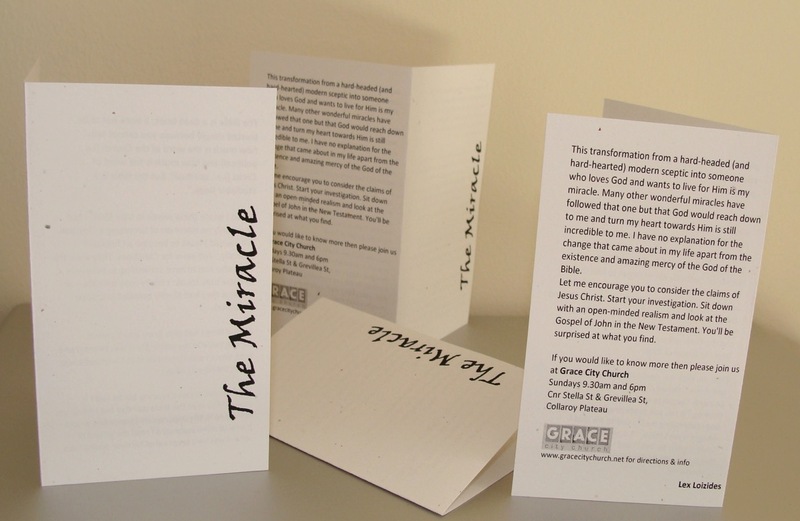 Evangelistic leaflets (what used to be called ‘tracts’) have seriously fallen out of favour over the last thirty or forty years. For many Christians the very word ‘tract’ conjures up images of nutters on street corners shouting at passers-by or holding up boards which warn of Coming Doom! Those attracting attention by doing such things presumably also press little explanatory leaflets into the palm of any hapless shopper who shows the tiniest glimmer of interest. Later the tracts will be collected by street cleaners. Well OK. But I am enthusiastic about tracts not because I fit that personality type. What I’m suggesting is a different type of tract – it’s a personal one. Something written by you. And the kind of encounter in which you would offer someone your own personal tract is not impersonal or forced but friendly. I’m speaking about those brief moments where you meet someone – a complete stranger – and a few words might be exchanged, perhaps of thanks, and off you go into the rest of your day: you purchase something at a store; you pay for your meal at a restaurant; you speak with a teller at the bank. I concede that these moments of friendly encounter don’t strike every follower of Christ as a potential opportunity to share the gospel. In fact an attempt to merely speak about your faith then and there would usually feel awkward. We meet several of these strangers every day. They are usually serving us and yet don’t feel the need to serve them. Why? A young woman in our church in Missouri asked Jo and I to pray for her. She was genuinely distraught. She told us that she works in MacDonald’s and that it was wearing her down. She felt that customers had no respect for her, they were rude and impatient. Added to that, they were hungry and irritable and if she made any mistakes they were utterly unforgiving. Customer after customer, hour after hour, day after day. It was soul-destroying. Obviously we prayed for her, but I thought to myself, what a difference Christians could make! Instead of moaning about how slowly they were being served they could serve the person with a smile and a simple word of encouragement. What a difference that might make to a discouraged person’s day. And then if they were able to add to that encouragement by giving the person their own story of how God’s grace has impacted their lives they certainly would be ‘making the most of every opportunity’ (Eph 5.16). That’s what personal tracts are about. They’re not for your work colleagues or those who are already your friends. They’re for those chance encounters, where your willingness to serve might be the only moment of light breaking into someone’s darkness. Check out this amusing 18 minute video to find out how you can write and produce your own. And please feel free to leave a comment on your own adventures. Next Article Why is the Salvation Army called the Salvation Army?